The works on this disc are considered in some detail during the course of the interview above. 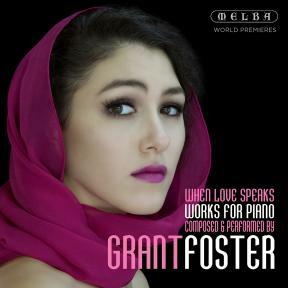 The recent (2015) Romances are both adaptations of other works by Foster, in the first case a song (The Silence of Love) and in the second a theme from his Second Piano Concerto. The performances are remarkably touching, Foster clearly relishing the natural ebb and flow of his own music. Closer listening reveals his attention to detail and his very careful balancing of lines and chords. Both Romances have a sort of cloudy nostalgia, a sense of aching regret, that is related to those emotions in Rachmaninoff and in Chopin. Perhaps the sheer tenderness of the second Romance is the most striking. The Piano Sonata, composed in 2012 and revised in 2015, is a response to war and the cry of pain that seems to be heard in musical terms at the outset, coupled with a sense of inexorable, grinding forward movement, takes us to another plane of expression. As the movement progresses, so does the sense of flow until the music takes on a sort of liquid inevitability; the central movement, a Lento molto espressivo, is the longest movement; the melodies unfold beautifully, almost as if we are in the presence of a present day Schubert. The finale includes a gentle melody towards the end inspired by the thought of a mother’s prayer, and simply beautifully delivered here; the close of the piece is determined and virtuoso: unutterably final and powerful. The Elegy that follows, an homage to Robert Helpmann (a supporter of Foster’s music) acts almost as a consolatory gesture, its textures pared down, the whole almost a statement of the essence of Foster’s compositional technique; one gesture of a keening suspension is, in particular, effective. Inevitably, the word “Bydlo” instantly invokes Mussorgsky, but if you follow the URL given in the interview above you’ll get to see the image that inspired Foster’s piece (itself inspired by Mussorgsky), a 2009 etching by Geraldine van Heemstra, Foster’s music seems the perfect response to the etching; onward moving yet at the same time curiously harmonically static, a condition that led to my comments above linking it to minimalism (in particular the music of Glass, in fact). The dedications of each of the Six Preludes of 2011 are explained above. The first is simply called “Loss” and is indeed a desolate meditation on that state; the second speaks of lives not lived to the full (at least from the perspective of that person himself). Phrases begin with flowing, arpeggiated accompaniments but most frequently end with a pitch suspended in the air, as if unsure of where to go next. There is a sweeter sense of nostalgia to the third offering, dedicated to someone who felt life’s sweetness, while Prelude No. 4 speaks of someone who the composer considers as now “singing with the angels”; indeed, it bears the inscription “Dedicated to an angel, Marie”. Her story is touched with the sadness of an operatic heroine; there is a Middle Eastern tinge to the delicate Prelude No. 5 (dedicated to Mira Yevtich’s husband) before the slightly eccentric Sixth—hints of Satie’s gnomic expression here, perhaps. Finally, the quarter of an hour Ballade, an exploration on the concept and trajectory of relationships. It is the longest single uninterrupted span on the disc, and unfolds with a glorious narrative sense in the composer’s own recording. Foster’s touch is perfectly placed, his legato in long chordal melodies almost vocal, while climaxes are positively radiant. All of the works here are first recordings with the exception of the Elegy, which Foster fist recorded in 1987. The composer’s own performances are beyond criticism. The excellent recording captures Foster’s glowing (sometimes glowering) piano tone to perfection.